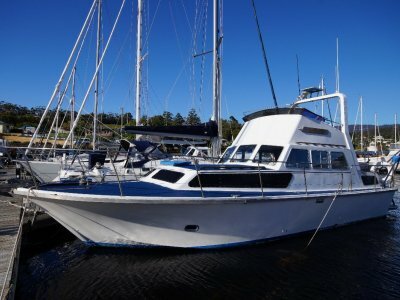 AU $449,000	Base price Need Finance? AU $449,000	Base price Need Finance? Need Insurance? Contemporary elegance is complemented by total transparency and seamless space. 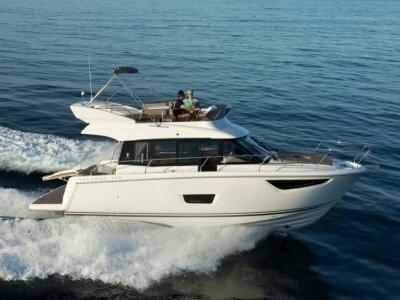 The modular internal features are restrained and comfortable: cabins, huge bathroom, saloon, storage... And more. Sterndrive transmission and carefully-chosen engine power are responsible design features. A sophisticated product that will appeal to true connoisseurs. Advertised price includes 2 x Volvo 200hp diesel engines, Premier trim level, registration, safety equipment, factory rebate, GST, duty and local delivery within Melbourne, Sydney, Perth or Brisbane. 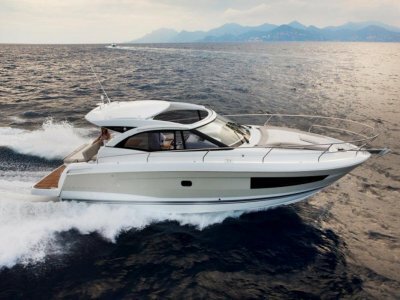 Other factory or locally fitted options available including but not limited to engine upgrade, electronics, mooring equipment, and antifouling. Please contact us for the complete options price list. Twin Volvo D3 200HP Or: Option for Twin Volvo D3 200HP w/ joystick control. Two separate cabins. Enjoy a view of the sea from the main cabin with its white decor complimented by darker contrasting tones. Complete with reading light and walk in wardrobe with a hatch providing natural light. 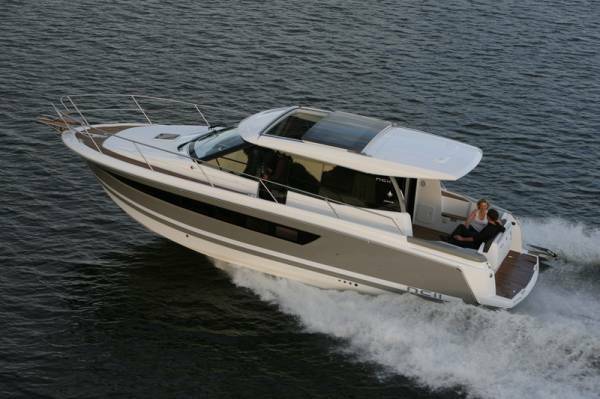 The aft cabin can be configured with either a double or twin berths. Open to the cockpit, the galley, with built in microwave or classic oven, leaves no one isolated and boasts a view of the sea. While underway it is entirely integrated into the saloon furniture. In the cockpit the open modular design makes for a truly versatile living space. Three glass sliding panels disappear in one smooth motion, bench seating can be repositioned easily forward or back to suit.